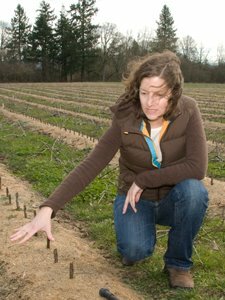 Registration is still open for the 2008 Sustainability Symposium for the Horticulture Industry, which will be at Chemeketa Community College, Building 34, in Salem (directions). This all-day conference (8 a.m.-5 p.m.) plus trade show is presented by CCC, OAN and the Sustainable Plant Research and Outreach Program (SPROut program), and it offers a packed agenda. There will be presentations on sustainability certification, consumer trends, waste management, energy conservation and water conservation. Presenters will include Katy Coba, ODA; Jim Gilbert and (pictured) Laura O’Leary, Northwoods Nursery; Tom Fessler, Woodburn Nursery and Azaleas; William McClenathan, Portland Nursery; Walter Suttle, Monrovia Growers; and many others. The event looks to be not just highly informative, but well worth supporting. The cost is $75 per person. The event also includes an optional day of tours on Friday, Nov. 7, at no additional cost. See a full listing here. To sign up, call Yvonne Testerman of CCC at 503-589-7946, or send e-mail.